Dr. Barron to EcoCAR team: I wish you great success in bringing in the next trophy! Members of Penn State’s Advanced Vehicle Team dispatched themselves to pick up Penn State President Eric Barron for a reception at the Thomas D. Larson Pennsylvania Transportation Institute this morning, and President Barron took the wheel himself to drive back. 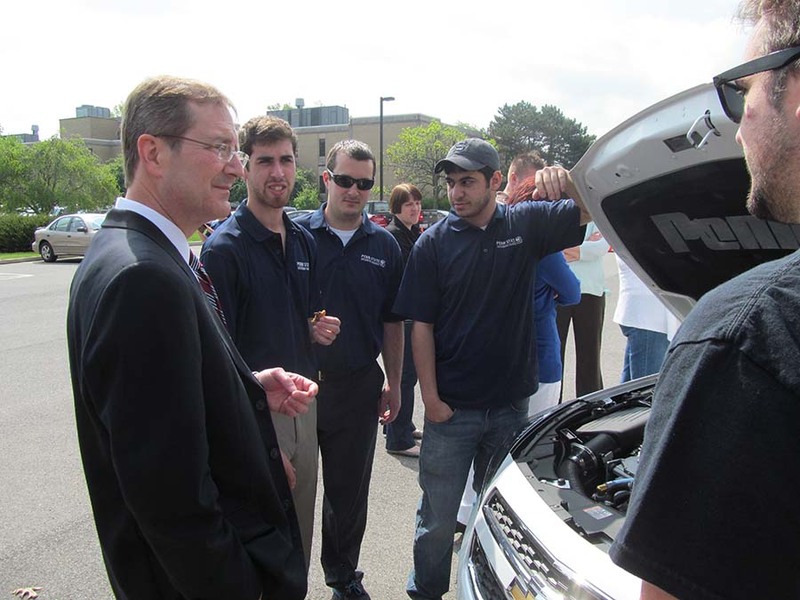 After disembarking, President Barron inspected the vehicle from the outside, spoke with several members of the team, and toured the Hybrid Vehicle Garage where the lion’s share of the work for Penn State’s advanced vehicle technologies competitions takes place. 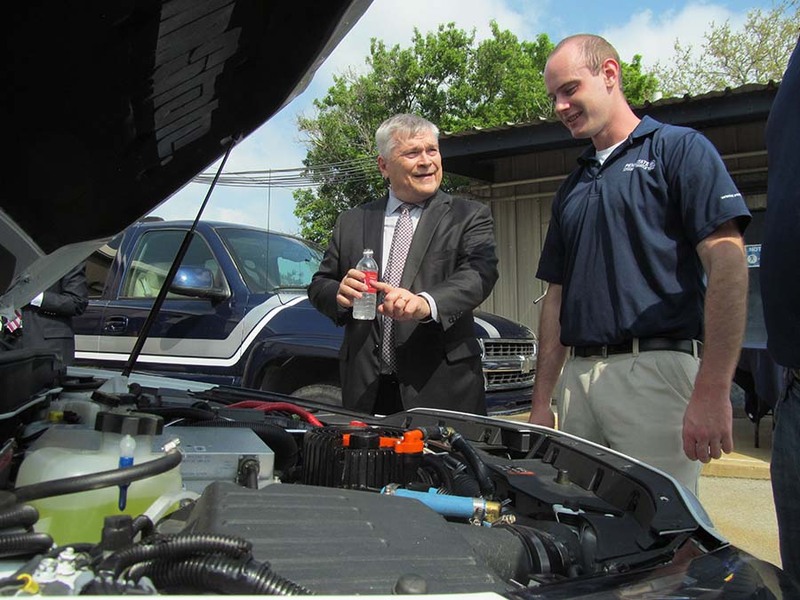 Penn State President Eric Barron shares a word with Advanced Vehicle Team member Tim Wilson. The team’s competition vehicle, a 2013 Chevrolet Malibu designed into an ethanol (E85) plug-in hybrid electric vehicle, was flanked by several other Penn State competition vehicles from past contests, which looked almost like retired elder siblings of the current competition machine, poised to see how this youngest vehicle in the Penn State family will do in Year Three of the North American EcoCAR 2 competition, which begins June 1. Tim Wilson, a recent graduate in mechanical engineering, took Barron through the garage and described some of the many tasks the students have accomplished, from pulling the stock motor out of the vehicle to recent refinements leading up to the June competition. Donghee Lee, the EcoCAR communications team leader, welcomed everyone and introduced Dr. Martin Pietrucha, director of the Larson Institute. Lee noted that the team comprises active student involvement from the colleges of engineering, business and communications. 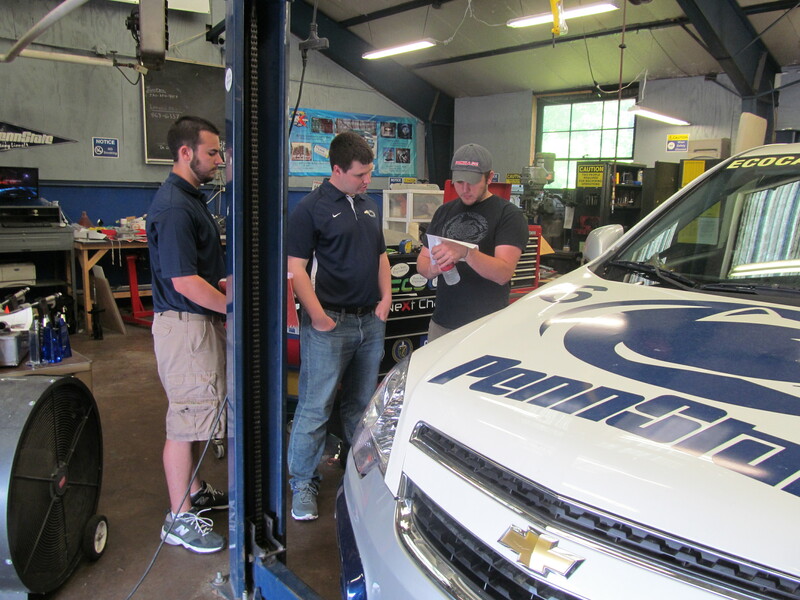 Penn State President Eric Barron gets an update on Penn State’s EcoCAR competition vehicle from Advanced Vehicle Team members Ben Sattler and Chris Monaco. “In the footsteps of its namesake, Tom Larson, a pioneer and visionary for both the University and the transportation industry, the Larson Institute continues to champion multidisciplinary approaches, such as ours, to develop practical solutions to key problems in transportation,” Lee said. Dr. Pietrucha noted the substantive track record Dr. Barron has accumulated as a researcher and administrator, including two decades at Penn State and being named a Distinguished Professor of Geosciences in 1999 and serving as dean of the College of Earth and Mineral Sciences from 2002 to 2006. “We’re fortunate to have a man of his stature, talents and humanity lead this great University,” said Pietrucha. 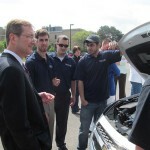 Charles Whiteman, dean of the Penn State Smeal College of Business, discusses the EcoCAR competition with members of Penn State’s Advanced Vehicle Team. The third thing Barron said he noted to himself was “the degree to which students burrow.” When this happens, “they don’t have the opportunity to interact with people that you find in successful enterprises, it’s that teamwork and ability to work with other individuals that have different talents that makes us truly successful, and quite frankly is a requirement in employment.” Barron found this team’s work principles to be squarely opposite from burrowing. 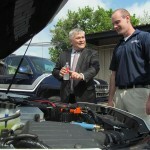 Penn State President Eric Barron hops into the EcoCAR competition vehicle. The team chauffeured Barron back to Old Main for his next appointment of the day. Attired today in their “dress blues,” the trademark polo shirts of the Advanced Vehicle Team, team members seemed to enjoy the chance to chat with Barron and other visitors, including Charles Whiteman, dean of the Mary Jean and Frank P. Smeal College of Business, Karen Thole, head of the Department of Mechanical and Nuclear Engineering, representatives of the Strategic Interdisciplinary Research Office, as well as current and past advisors and members of previous Penn State vehicle competition teams. Soon, it was time for Barron to get chauffeured back to Old Main for his next obligation as University president. And it wasn’t long before the pull of the competition took the Advanced Vehicle Team members back to task, and the inevitable pre-competition conversation: What’s the next detail to address? The Centre Daily Times offers additional coverage of President Barron’s visit. EcoCAR is ready for the big event! Preparations for both the upcoming EcoCAR competition and President Barron’s visit have occupied Penn State’s Advanced Vehicle Team this week. The team had plans since November to replace the Malibu’s brakes to reduce vehicle weight, and only recently got the nod from competition organizers, said Nick Wyckoff. Weight savings of 15.5 pounds came from the rotor hat being made of aluminum, rather than cast iron, and the rotor’s two cast iron disks being thinner than the stock equipment. The vehicle just returned from a 120-mile drive and testing of the new brakes at the Larson Institute’s test track facility yesterday. Testing included testing the brakes at hot temperatures. The team was busy practicing presentations until 11 p.m. last night, said Wyckoff. “And we’re back here early this morning,” he added with a smile. Today’s send-off reception is timely. The vehicle could ship as early as Friday. The team won’t know the date of shipping until the tractor trailer rolls into the parking lot to get it. The competition will begin in earnest at the GM Proving Ground, Milford, Mich. on June 1. 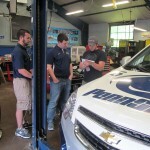 For more information about the Penn State Advanced Vehicle Team, visit their official page on the EcoCAR 2 website or go to the PSU AVT website.